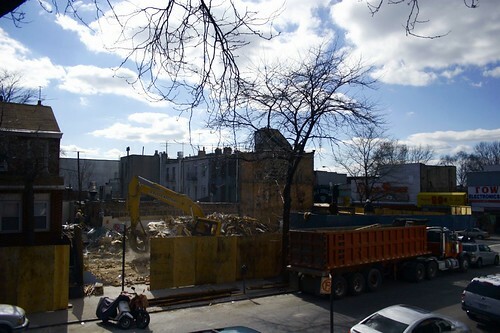 when i first moved to park slope in early 2003, i moved here because my friends lived around here and there were still good apartment deals to be found, especially if you didn't mind being south of ninth street. i got an apartment on 13th street and 5th avenue - a one bedroom on the top floor of a three floor townhouse. it was next to an old karate studio that, according to the woman who owned the building (and lived in the garden apartment) had in a previous incarnation been a chop shop. across the street, there was a salvation army and about 5 blocks away, there was a lone neighborhood bar. however, there were a whole lot of 99 cent stores and plenty of discount electronics stores for all your cheap-o shopping needs. after a couple of years, we got cafe regular (my favorite coffee shop), commonwealth (a really great bar - full disclosure, owned by a friend) and several well known bank branches. 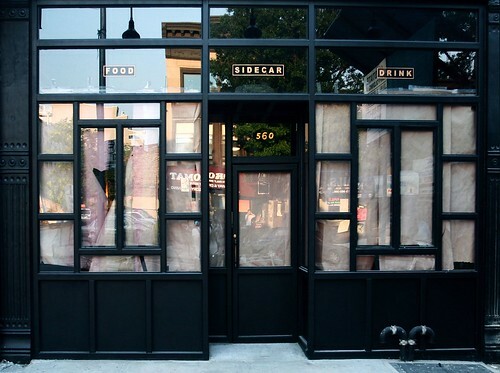 the only establishments still missing were (and still are) the restaurants - however, word on the street is that a new (late night) dining spot is being opened by a former employee of blue ribbon on 5th + 15th st. called sidecar, which sounds promising. ok, so that was the set up and here's the real reason for this post. after a couple of years of living at 275 13th it seemed like a good time to find another apartment. some of the reasons included the brand new metal bar that had opened up next door (in the former chop shop/karate studio) and the fact that they were in the process of tearing down the salvation army to build a brand new luxury condos . a process that is still going on today, almost two years later. yesterday, i got an email from the former downstairs neighbor with some news to share. as it turns out, the landlord is trying to sell the building. the catch, she wants 1.16 million for a building that, trust me, needs a whole lot of work to be worth anywhere near the asking price. that and the fact that it's the first house on the block, it's next to a metal bar (they are really nice, just very loud) and across the street from a seemingly perpetual construction site, are probably why it's been on the market since february. 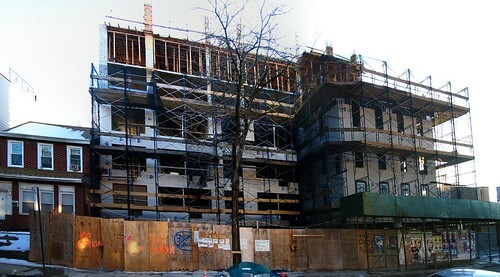 you can check out the corcoran pictures of what 1.16 million gets you these days in the southern end of park slope here. 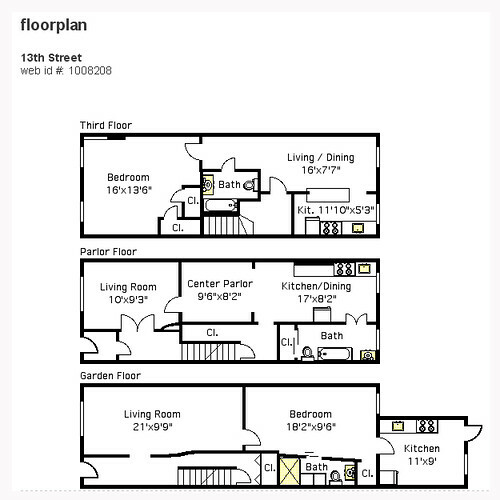 floorplan of what 1.16 mil. gets you these days. there was a rumor that the retail anchor for the new condos was a baby gap. 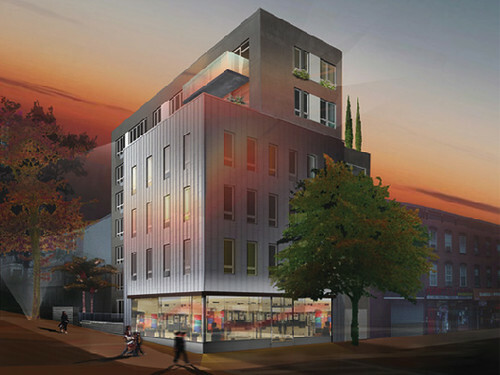 artists rendering of the new condos. the real story here is not a new one, real estate in brooklyn is crazy. will she get her asking price? who knows...but i do know that the neighbors who sold next door had done extensive renovations (and converted, what was formerly two duplexes, into a single family home) got 1.33 for their home. and perhaps the real kicker here, is that the house was purchased in the mid to late 90's for under 200k. not bad for a 10 year investment. for more detailed property information check pshark. the house did not sell and is being removed from the market. the new plan is to keep the property as a rental. currently, she has purchased a house in new paltz and is going to "wait out the bar." speaking of sidecar; the other brother opening the bar is Bart, from O'Connor's. He's the dashing chum who "introduced" Jamie and I. They are having a private invite only run through this weekend that I'm extremely excited about. Finally, a grown up bar just when I'm ready to start acting like a grown up! glad that it's opening soon, you'll have to let me know how the soft opening goes.